A life long resident of Sherborn, I received my certificate as a Veterinary Technician and worked in that field for seven years. Following this, I assisted in the running of a boarding facility for dogs and cats until returning to school and becoming a Certified Respiratory Therapist. 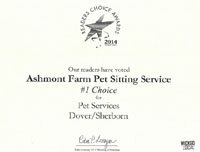 I worked full time in this field for 15 years, and started Ashmont Farm Pet Sitting Service while doing so. This business was in such high demand, I soon left Respiratory Therapy to devote myself to making the pet sitting service a full time business. Since 1981, I have served as State Animal Inspector for the Town of Sherborn. I am part of the Guardian Angel Program at Best Friends Animal Sanctuary, sponsor a cage at the Metro West Humane Society, and belong to Pet Sitters International. I share my home with 1 Labrador Retriever, 1 Pembroke Welsh Corgi, and 1 miniature donkey. Jeanie has been managing our office for nearly a year now. When Kim had knee surgery this summer, she filled in, taking care of cats, birds, and a bunny. Jeanie has been a pet lover and owner for many years. She has managed many different types of business offices. Peter is a qualified Social Worker who has worked full-time with dogs for the past thirteen years as both a dog walker and trainer. He enjoys working with all dogs and is especially skilled at working with canines with challenging behaviors, such as dog aggression, anxiety and poor behavior on leash. Recently Peter walked a dog down the aisle at it's owner wedding. He believes that every dog is unique and a special part of its owner's family. ©copyright Ashmont Farms Pet Waggin 2013. All Rights Reserved.